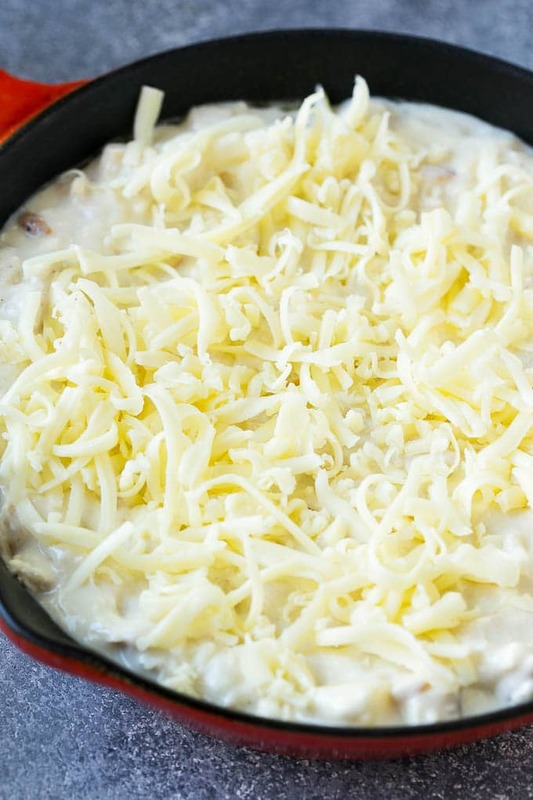 This chicken Alfredo dip is diced chicken mixed with Alfredo sauce and three cheeses, then baked until hot and bubbly. An easy and unusual party snack that’s bound to get rave reviews! Hot dips are always a crowd pleaser, we love pizza dip, buffalo chicken dip, and this super delicious chicken Alfredo dip. Serve it with a variety of dippers and watch it disappear! Chicken Alfredo pasta is one of those time honored recipes because it’s just super delicious! There’s something so satisfying about the combination of chicken and pasta in a rich and cheesy sauce. This chicken Alfredo dip is the appetizer version of this classic dish. How do you make chicken Alfredo dip? This recipe starts with cooked, diced chicken. You can cook your own chicken, use leftover chicken, buy a rotisserie chicken, it’s up to you! The chicken is mixed with Alfredo sauce, cream cheese, mozzarella cheese, herbs and parmesan, then topped with more cheese and baked. For the sake of convenience, I recommend using a high quality pre-made Alfredo sauce from the refrigerated section at your local grocery store. If you’d like to make your own homemade Alfredo sauce instead, here is a basic recipe. This recipe will make more than you need for this dip, so you can either halve the recipe or save the rest of your sauce to go over pasta. Melt the butter in a large pan over medium heat. Whisk in the flour and cook for 1 minute. Pour in the milk and cream, then simmer, whisking constantly, until sauce has just thickened. Add the parmesan cheese and Italian seasoning to the milk mixture, along with salt and pepper to taste. Stir until cheese has melted. This dip can be assembled in advance, then stored in the fridge for up to 8 hours before you plan to bake it. You will need to add a few more minutes to the bake time if you’re starting with a refrigerated dip. I typically use mozzarella and parmesan cheeses in this recipe because they’re classic additions to chicken Alfredo, but other great options are fontina, asiago or romano cheeses. Chicken Alfredo dip is not complete without the toppings! I add bacon, tomatoes and parsley for some texture and color. 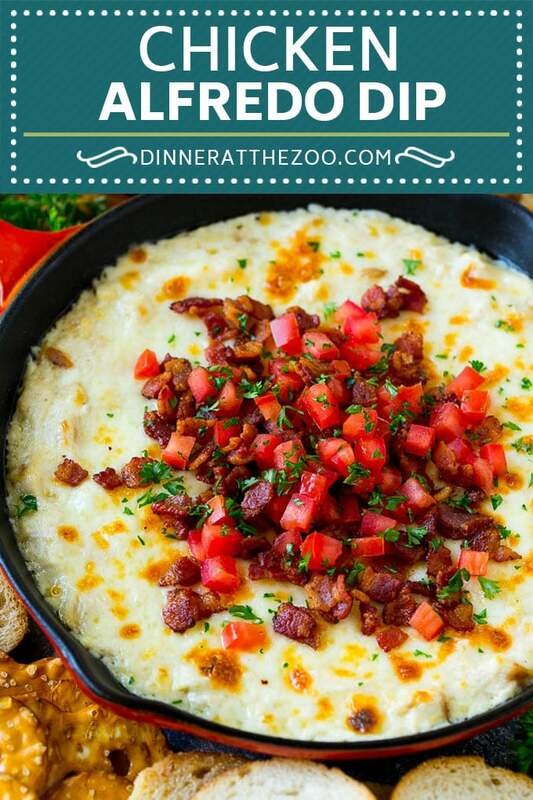 The flavors pair perfectly with the Alfredo base and you can never go wrong with bacon. I serve my chicken Alfredo dip with baguette chips (crostini), breadsticks and pretzel chip. Other great options include fresh bread, crackers and vegetables. Once you try this Alfredo dip, you’ll be totally hooked! 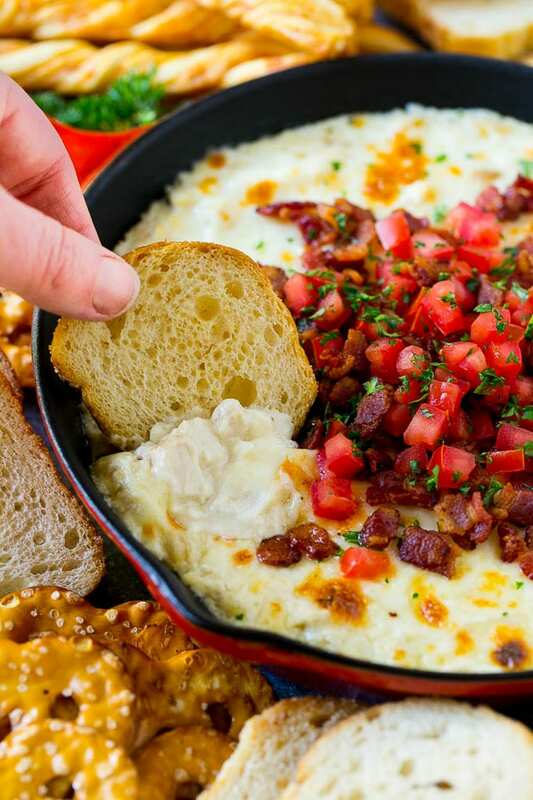 It’s great for parties, game day, or just when you have a hankering for some cheesy comfort food. Every time I bring this dip to a gathering I get so many requests for the recipe! This chicken Alfredo dip is diced chicken mixed with Alfredo sauce and three cheeses, then baked until hot and bubbly. An easy and unusual party snack that's bound to get rave reviews! Preheat the oven to 375 degrees F. Coat a small skillet or baking dish with cooking spray. Place the chicken, Alfredo sauce, cream cheese, parmesan cheese, Italian seasoning and 1/2 cup mozzarella cheese in a bowl. Stir to combine. 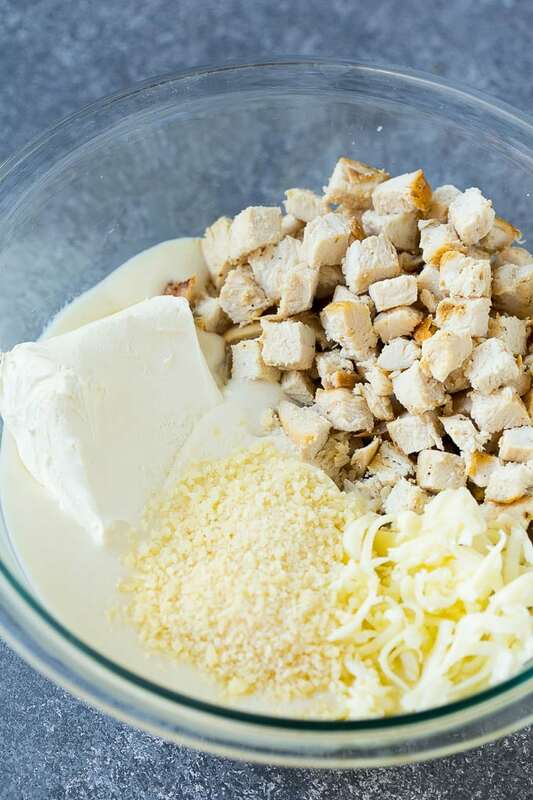 Spread the chicken mixture into the prepared pan and top with remaining cup of mozzarella cheese. Bake for 20 minutes or until dip is bubbly and cheese is melted. Turn the oven to broil and broil for 1-2 minutes until the cheese just starts to brown. 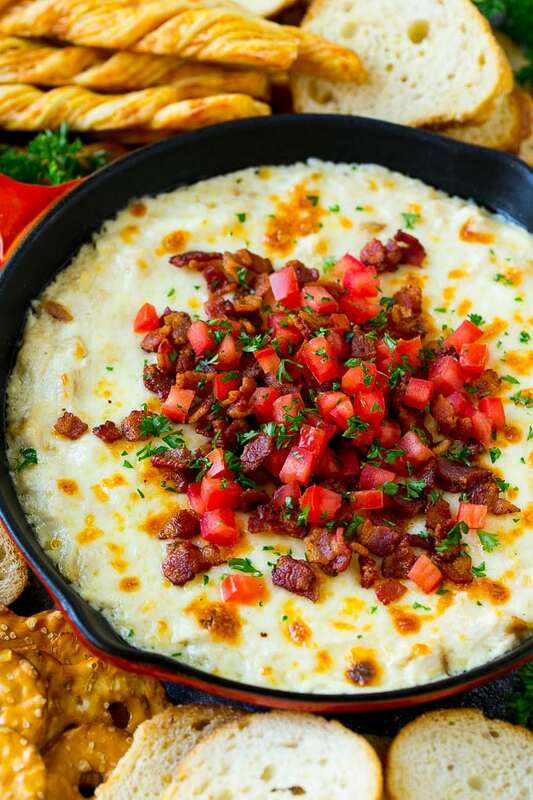 Top the dip with bacon, tomatoes and parsley, then serve. If you'd like to make your own Alfredo sauce, refer to the post text for a basic recipe. Chicken Alfredo dip is my favorite for my left over breads. It makes every bread tasty and yummy. I hope I can make this later tonight. I’ll add more cheese to it! You had me at alfredo! YUM! 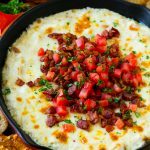 I am definitely trying this dip at my next gathering as it looks delish! This looks sooo delicious! I love myself some melted cheese… but combining it with all these ingredients – yum! I need to try this. The weekend is almost here so reading about this recipe just came in time. My family will be surprised when I tell them that they are going to have a family favorite in the form of a dip. We love Chicken Alfredo but haven’t tried it as a dip. Very interesting! Oh my gosh, I need this right now! I’m already a huge fan of chicken alfredo pasta… but in dip form?! Yes, please! Delicious! I have not tried making a dip like this, but I sure will make it the soonest. I am also interested in the Shrimp scampi dip recipe. Will download and save that too. We love chicken alfredo around here! I never would have thought to make it into a dip. Looks so good! I don’t think it’s a party until dip is put on the table. This sounds like a real crowd pleaser! That is one delicious sounding dip! I’ve planned to have a dip bar set up for our Super Bowl party, and this is definitely going to be on it!